The Commercial Vehicle Show (CV Show) is the best attended, largest and the most comprehensive road transport and commercial vehicle event held in Britain, providing truck and van operators with far greater choice than can be found anywhere else in the UK. The Show attracts close to 21,000 business visitors and its central location at the NEC Birmingham, ensures a truly nationwide attendance. For operators it is the annual meeting place and for sector suppliers the ultimate showcase for your products and services. Are you exhibiting at the CV Show 2019? 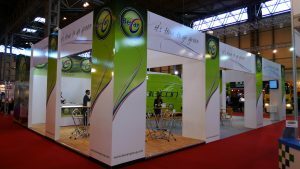 Do you need an exhibition stand? Are you looking for an exhibition stand for The CV Show 2019? To make life simple and care-free, we offer a complete turn-key service, managing all aspects of the stand build…. all you have to do is turn up on the day. Our specialist designers create the perfect platform for you to showcase your company and products, maximizing brand engagement.